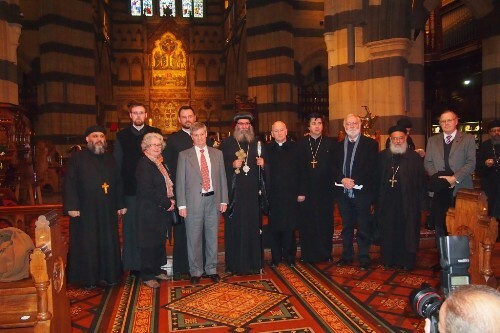 On Saturday 17th August, Coptic Christians gathered at St Paul's Cathedral in Melbourne where Bishop Suriel of the Coptic Orthodox Church held a service to pray for Christians persecuted and killed in the current violence in Egypt. ACL was represented by Paul Whitehead; Liberal MP for Menzies Kevin Andrews was also present, along with representatives for the Prime Minister and the Catholic Church. Bishop Suriel was interviewed by 702ABC Sydney yesterday about the current persecution and violence against Coptic Christians in Egypt in light of the mass on Saturday. To listen to the interview and read more about the issue, click here. Violence against Coptic Christians has escalated in Egypt since the Muslim Brotherhood came to power. In April this year, a violent attack against Christians at St Mark's Cathedral in Cairo left two people dead and many wounded. Dozens of churches around the country have been looted and torched, and threats have been made against the new pope in Alexandria. Christian women have also been sexually harassed and abused on the streets of Cairo, and shops and homes in Christian villages have been graffitied and vandalised. The ACL has long advocated for greater action to be taken by the Australian government to ensure the protection and safety of such vulnerable minority groups. Earlier this year, the ACL urged the government to condemn these attacks and to put pressure on Egyptian leaders to uphold freedom of religion in the country.